This time of year the bird food section of stores includes packets of pre-mixed bright red nectar and hummingbird nectar powder mix for hummingbirds. 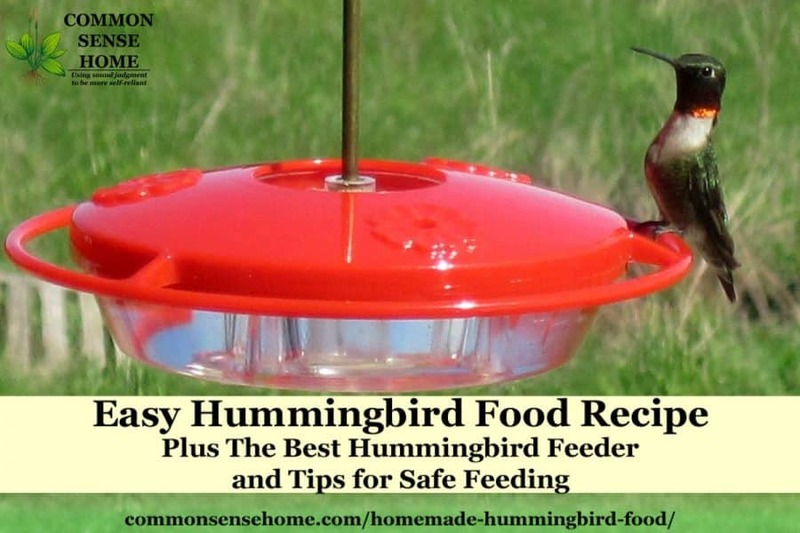 If you like to feed hummingbirds, save yourself some money and skip the red food dye, and mix up this easy homemade hummingbird food recipe. It couldn't be simpler. Also, I'd like to recommend what I think is the best hummingbird feeder, and some tips for keeping your hummers healthy. Maintain a 1:4 sugar to water ratio for your homemade hummingbird food. Use clean, unchlorinated tap water. Heat the water to boiling (to kill any bacteria). Stir in sugar until dissolved. Allow the hummingbird nectar to cool to room temp before placing in feeder. Refrigerate any unused portion of the hummingbird food for up to a week. Change your hummingbird nectar at least every three days, especially in warm weather. Watch out for mold growth or fermentation. Any off smell or off color or cloudiness is a bad sign. Clean the hummingbird feeder thoroughly and clean and refill more frequently – before the hummingbird food becomes cloudy. Contaminated food can make the hummingbirds sick. Use non-toxic dish soap or a vinegar water solution and rinse well. Wash your feeder every time you fill it. Take special care to clean around each feeding port with a cotton swap, old toothbrush or pastry tube brush, or some combination of the three. The little nooks and crannies around the opening are the most like spots for debris buildup and mold growth. We use a pastry tube cleaning brush to clean in the holes, and clean around them with an old toothbrush. The article “What Do Hummingbirds Eat?” by BirdWatcher's Digest also suggests that hummingbirds enjoy real maple syrup and tree sap, plus they eat many small bugs. Honey is not recommended because it may contain live bacteria. One thing I've noticed about most hummingbird nectar feeders is that they are terribly hard to clean. Even a good bottle brush has a hard time getting into curves and tight corners. Many references advise using a bleach water rinse to kill any bacteria, but it's tough to guarantee the effectiveness of this and also to make sure the bleach is completely rinsed out. After looking in vain for an easy to clean hummingbird feeder at the local hardware stores, I finally came across the Hummzinger Mini at a specialty wild bird shop. This feeder is composed of a hanger and two pieces shaped roughly like hollow doughnut halves. The two halves clamp and unclamp like a plastic Easter egg, leaving the center of each wide open for easy cleaning. In the center of the reservoir, there's a separate reservoir that can be filled with water to deter ants. 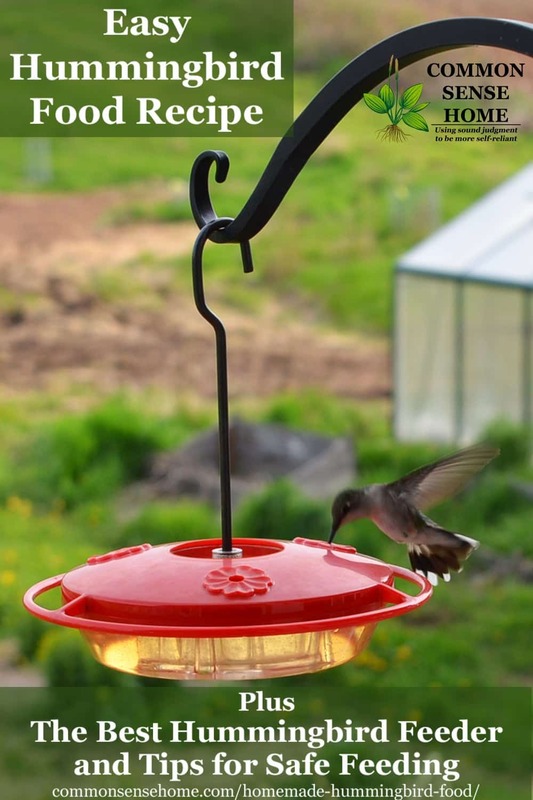 You can see the Hummzinger hummingbird feeder in action in the awesome hummingbird video below. While marketed as a hummingbird feeder, I have had orioles come and perch and use the feeder as well. They also have a Hummzinger Ultra, which holds 12 ounces, for those who have a larger hummingbird population. Their Humblossom holds only 4 ounces, which means less dumping old nectar if you only have a couple of hummingbirds to feed. Enjoy these little beauties while you can. For those of us in the north, winter will be here again all too soon. So enjoy your articles. I make the 4:1 ratio using only cane sugar. I have found my little guys love the classic glass feeders (the hard to clean ones). So I clean each time and use dried beans in the feeder shaking and rotating the entire feeder and find this cleans away any residual mold etc. Also will try your grease on hanger idea for ants. Thanks! White vinegar is also a great cleaning device! Hot water & vinegar soak. Please do NOT grease the wire of the hanger to deter the ants! It will quite possibly get on the wings of the hummers flying by or on the feet of those birds looking to perch. Remember, birds perch on ‘branches’ going any direction. As to those having trouble with hornets, hang an ‘eradicator’ for them. There are some pretty good homemade ones shown on the internet eg. : cut top 1/3 off 16oz. to 2 liter drink bottle- Turn top into bottom and attach together with tape or such – put water and sugar/’sweetner’ in. I use a mix of water and sugar-free drink mix as it has an overly sweet smell. DO NOT use any sugar-free mix for other animals! I put Vaseline at the base of the Shepard’s hook, then applied cinnamon on Vaseline. No ant’s !! I too had a huge ant and bee problem. Last year I bought a new feeder like the one you have and NO MORE ants or bees. GREAT product!!!! That is a great feeder and recipe! My parents LOVE their feeder I will share this recipe with them. I’d fill the moat with water and grease the access pathways. I hate to put anything toxic near where I’m feeding the birds. If you’ve got an ant infestation inside, you can mix some borax with the sugar water and put it in a shallow dish near the infestation. They will carry it back to the nest and soon be gone. What do you grease with? Something like mineral oil would be the most resistant to weather and rancidity. Some feeders have little bee guards that go over the ports to keep the bees and yellowjackets out, but I haven’t tried them. If/when I start seeing too many yellowjackets in the area, I rig up a simple bottle trap with sugar water in the bottom. You can see an example in the post “Non-toxic Home Pest Control“. Great ideas here, thanks. I would put a just a little Peppermint or Eucalyptus essential oil in the water in the center used to deter ants. Don’t use floral essential oils, as these can attract bees and flying insects. The finch shown in your humming bird feeder photo is a female English sparrow (Passer domesticus). I can only add that wherever you live, I envy the idea that your query infers the possibility of it being some place relatively, blessedly free of this invasive & notoriously impactful species ! We have an assortment of finches around here, but there are invasive species such as starlings, too. I try to create a diverse habitat, and avoid putting out too much of the starlings’ favorite foods. Read that Hummers love maple syrup. Is that pure maple syrup or do you dilute it with water? Hummingbirds do eat trees sap, and will follow the migration of the sapsuckers so they are able to harvest from the sapsucker holes. I did find a comment on Bird Watchers Digest that noted that researchers have offered maple syrup to the hummers, and the hummers “readily take to the sweet drink”. That said, there is some concern about increased risk of fungal growth in maple syrup versus plan sugar water. Whatever you decide to do, make sure that you clean your feeders frequently, and always use fresh food. The Audubon Society also notes that, “Organic, natural, and raw sugars contain levels of iron that could be harmful.” This is talking about cane sugar, not maple syrup, but I figure if you’re thinking about feeding maple syrup, I figure you probably also have organic sugars on hand. I use this same feeder and use it in full sun in the Southwest. I change the sugar water every two to three days. To clean, I use hot, soapy water and let it soak for 15-30 minutes. I then use my water jet (used on teeth) to clean all the feeding holes so that any bacteria is definitely washed away. I use the hot, soapy water again then rinse thoroughly. A newly planted tree will eventually allow me to hopefully hang the feeder in the shade. I fill the water reservoir several times throughout the day to keep it full so other creatures can’t get into the feeder. I frequently find finches and wasps drinking from the reservoir.